I am pleased to announce our offering of a very rare printing of the Declaration of Independence. Benjamin Towne’s July 6 Pennsylvania Evening Post was the first newspaper to print the Declaration, and only the second printing in any format. It will be sold at public auction in New York on June 25, 2013, by Robert A. Siegel Auction Galleries, as part of their 50th annual Rarities of the World sale. 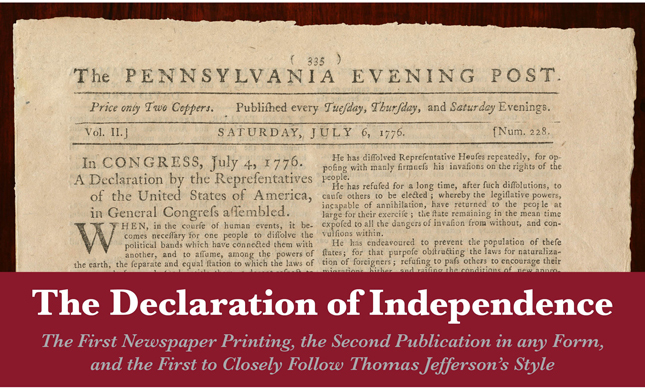 Our catalog explores differences between the Post’s Declaration and the Dunlap broadside, the only earlier Declaration imprint (published on July 5th). I know it sounds dry, but our catalog announces an interesting find: our newspaper is closer to Thomas Jefferson’s style while the Dunlap is closer to John Adams’. One intriguing possibility that follows is that there may have been two July 4 manuscripts—one penned by Jefferson and the other by Adams. The Pennsylvania Evening Post issue of the Declaration is one of only four copies found in major auction and dealer records of the last hundred years; we’ve had the privilege of handling three. Want to learn more? The Siegel auction catalog is available online here. We are also pleased to announce our new dealer catalog, Parallel Visions: American & Israeli Documents of Freedom. Parallel Visions explores the similarities in the ideals and founding struggles of two great democracies —both aspiring to be “a light unto the nations.” In these letters and documents—over many years and through multiple wars—we see George Washington, Theodor Herzl, Thomas Paine, David Ben-Gurion, Chaim Weizmann, Golda Meir, and other visionaries fight to create, develop, and protect new countries. We will happily work with any philanthropist interested in acquiring a critical mass of the collection and making it available for public display. See the catalog online here.